Top fixing of casters: top plate, threaded stem, friction ring stem and bolt hole. There are many kinds of materials on the wheels, such as: rubber, conductive rubber, PU on aluminum/ cast iron, nylon, phenolic and so on. 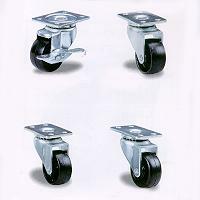 Light duty caster, medium heavy duty and heavy duty casters. Top brake, front / back brake and side brake. Plain, nylon, ball bearing, steel bearing and roller bearings. Special requirement are available upon request.